Written by Michael J. Musacchio, Jr., M.D. We are definitely feeling the heat here in North Texas and this hot weather is here to stay for the next few months. That is no excuse, however, for us not to keep up with exercise and core strengthening. While the heat may limit a lot of outdoor activities, some of the best exercises for your low back and spine can be accomplished indoors or in the pool. When it comes to training in a gym, there are some basic principles to keep in mind to avoid aggravating back injuries. In general, it is best to keep your exercises low impact and avoid excess strain on the low back. For instance, jogging can be a high impact activity on the spine and joints. We typically recommend walking on the treadmill at an incline, using the elliptical trainers or Stairmasters, or employing circuit training to get your cardio workout in. All of these are excellent core strengthening exercises as well, so they are pulling double duty for you. Additionally, the recumbent bike is generally recommended in favor of upright biking as it causes less stress on the low back. Beyond cardio, an essential part of one’s workout should be core stabilization. The concept of core stabilization is often misunderstood as doing hundreds of crunches or sit-ups may actually do more harm than good. Instead, lift weights or use weight machines in a seated position with your back straight and your abdominal muscles sucked in. This will turn every exercise into a core strengthening one. Remember, you strengthen your core and improve flexibility in your arms and legs. This will offload the stress from your spine and keep your back in better shape. 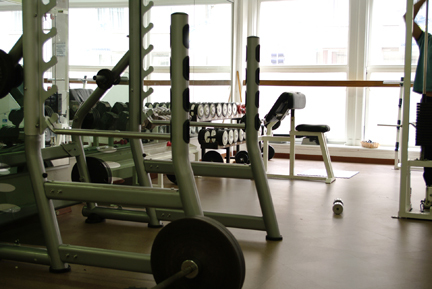 If getting to the gym is not an option, consider circuit training and body weight exercises as home. Body weight exercises include pushups and leg inclines with squats and lunges. Alternating these exercises for a minute at a time with a minute of rest in between can really burns calories and build strength at the same time. Even better, there is absolutely no cost and no equipment needed which means no excuses for not getting it done. You can mix in some light free weight work on an exercise ball and get just as good of a workout as if you were at a gym. Finally, pools aren’t just for lounging but might also be just about the best training out there for patients with lower back issues. 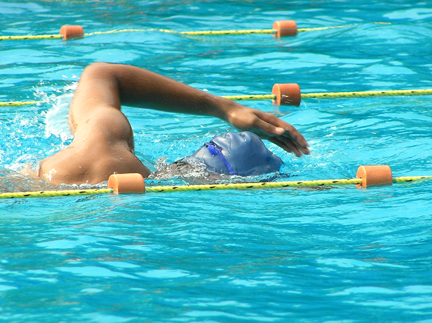 Swimming, aqua jogging and water aerobics are excellent calorie burners and core strengthening techniques. The resistance of the water challenges the muscles but the body isn’t absorbing the impact of traditional land based exercises. So, you can be working on your fitness while staying cool and not breaking a sweat. Remember, just because it’s hot outside it doesn’t excuse you from working on your fitness. Your body deserves better than that and if you don’t treat it right it won’t treat you right. Michael J. Musacchio, Jr., M.D. is a Center for Spine Care minimally invasive neurosurgeon specializing in the spine. Well written piece! Love the fact that you gave examples, basically telling people what they should (and shouldn’t) do as well as giving a wide variety of options.